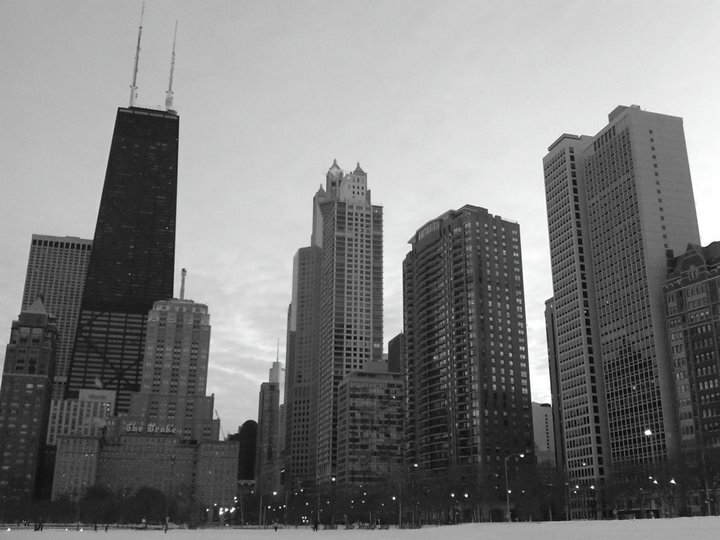 After a brief hiatus, FOLKLORE is back on the grid and ready to craft in the Windy City. So… let’s get to it! 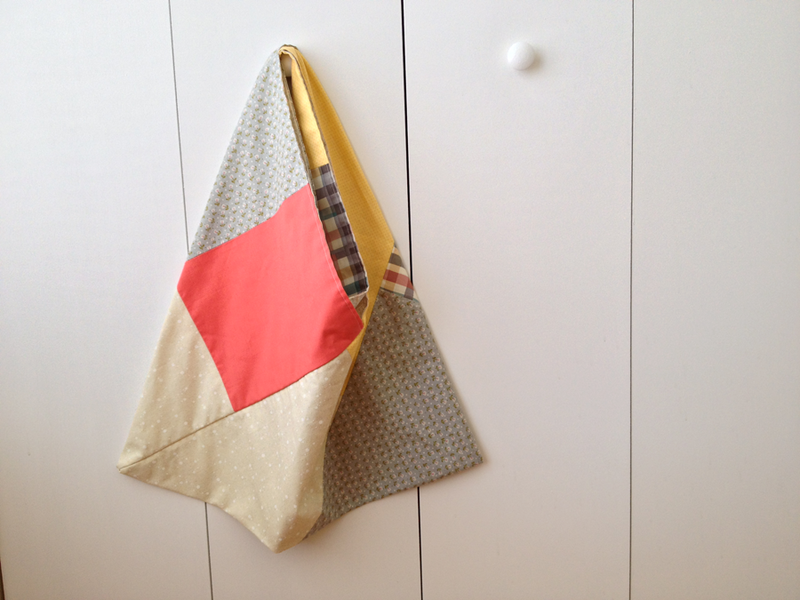 If you recall, I made a simple triangle bag back in January and it was instant love. 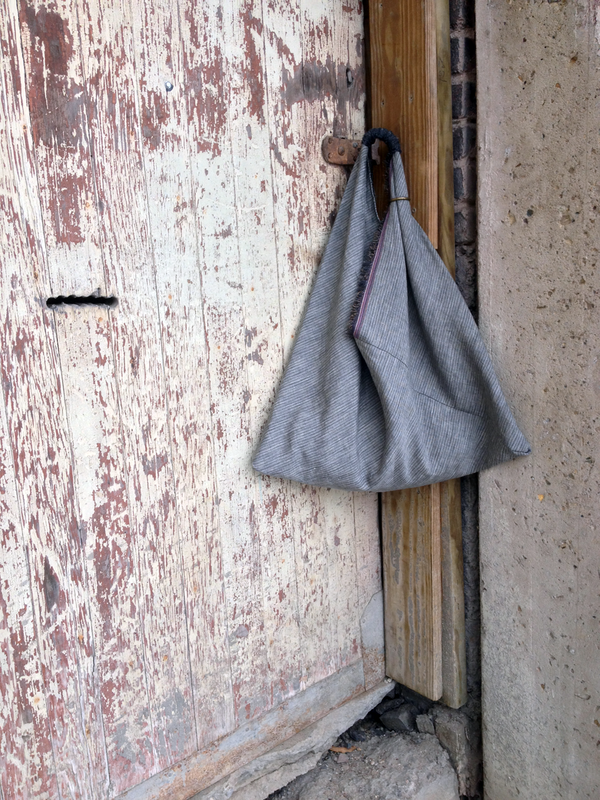 With a fold here and a seam there, I turned a single piece of fabric into a large, utilitarian bag that was perfect for toting around my belongings. Loved my creation so much that I decided to sew another one before we moved in March. This time around, I made things a little more complicated. Et voila! Advanced Geometry, if you will. In an effort to use up some of my fabric stash before the big move, I created a patchwork of springy prints and paired it with a delicate cream and denim floral to tie it all together. 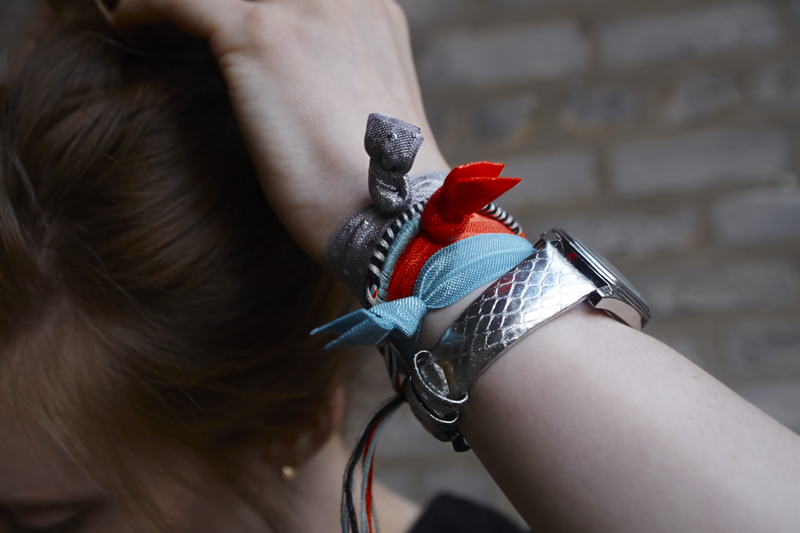 It’s a really sturdy piece and totally reversible – bonus points! I can’t wait to take this bag out for chilly mornings at farmers’ markets and sunny afternoons spent thrift shopping. Why, those are some nice seams! I have to say, those sun-washed hues are very much in line with Pantone’s Spring 2014 Fashion Color Report. Recently, I became painfully aware that my reusable shopping bags do not match my winter coats. Those crinkled, off-white cloth bags – while ever useful – clash horrendously with tailored black wool. 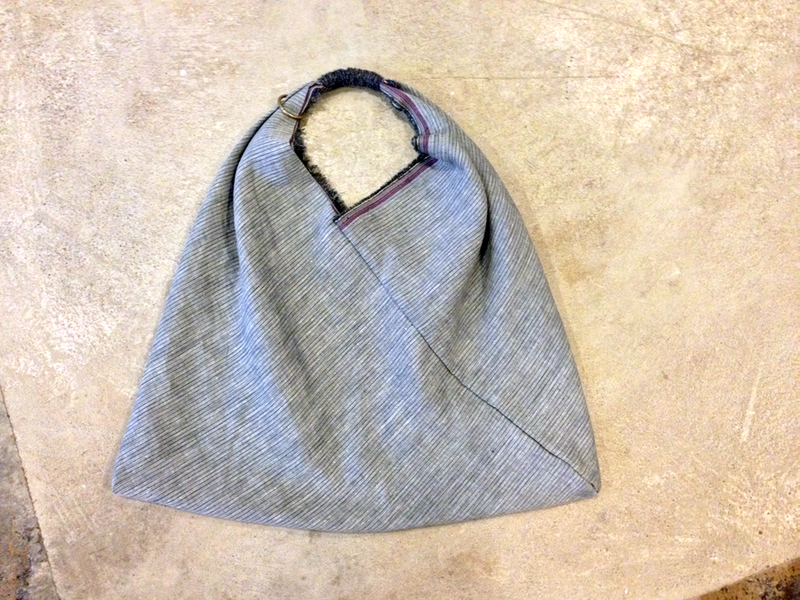 Fortunately, I stumbled upon a DIY solution – the triangle bag. With basic geometry and some imagination, you can turn a simple fabric rectangle into a cheap and oh, so chic tote of your dreams! I recommend using Between the Lines‘s tutorial, the original source of my inspiration. I put a personal spin on the directions by doubling the height and sewing a tube (18″ x 54″) for added durability. 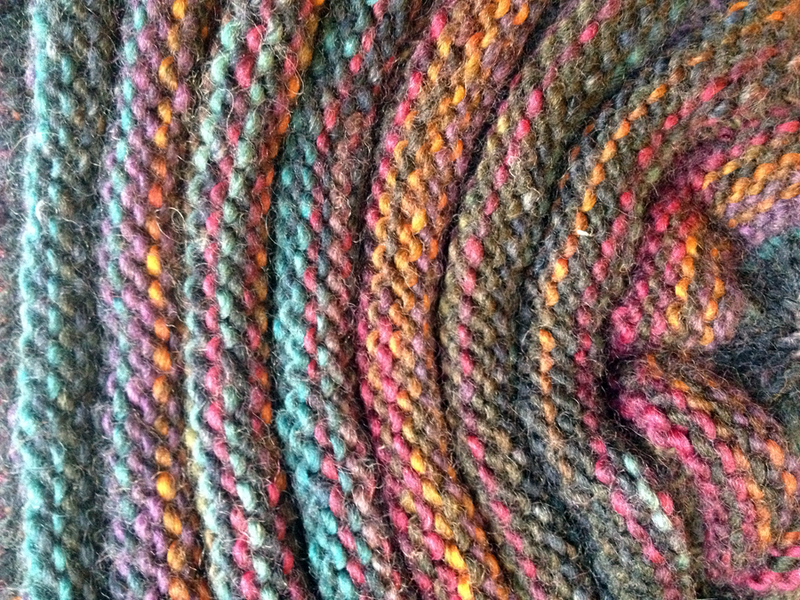 Once complete, my tote measured approximately 24″ x 20.5″. Like I said, it’s roomy. 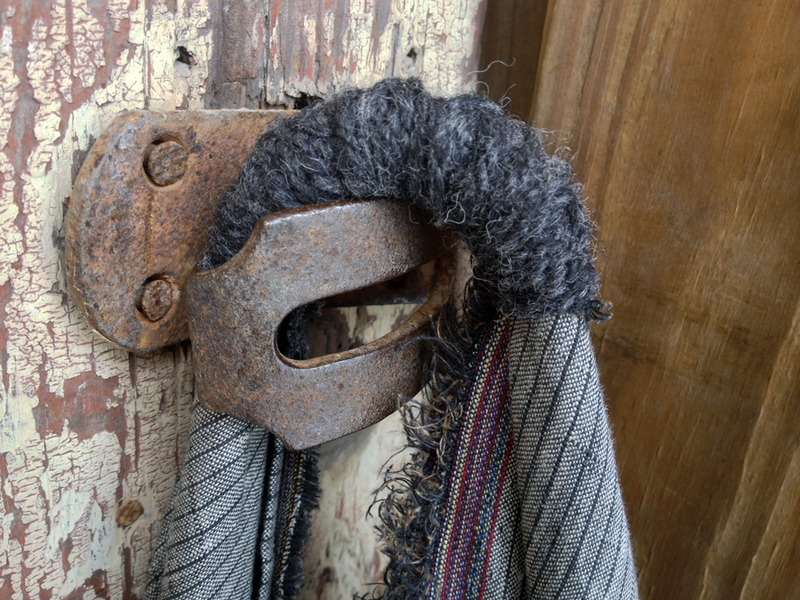 For the finishing touches, I wrapped the handle in charcoal wool and slipped on an antique gold ring for visual interest. Double bonus: I can add charms later! 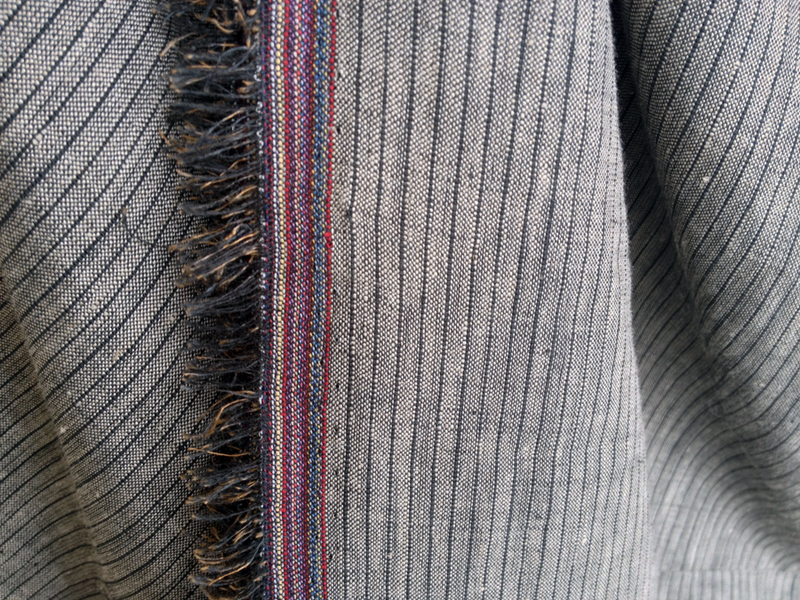 While I love the black, pinstriped linen, it was the colorful raw edge that really won me over. 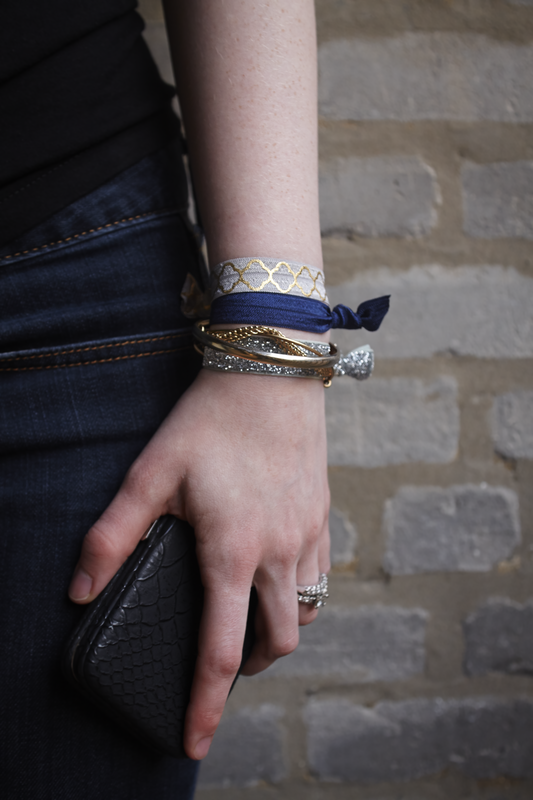 It’s perfectly imperfect and brings a hint of color to my dark winter wardrobe. I’ve already taken her out for a spin and was wholly satisfied. 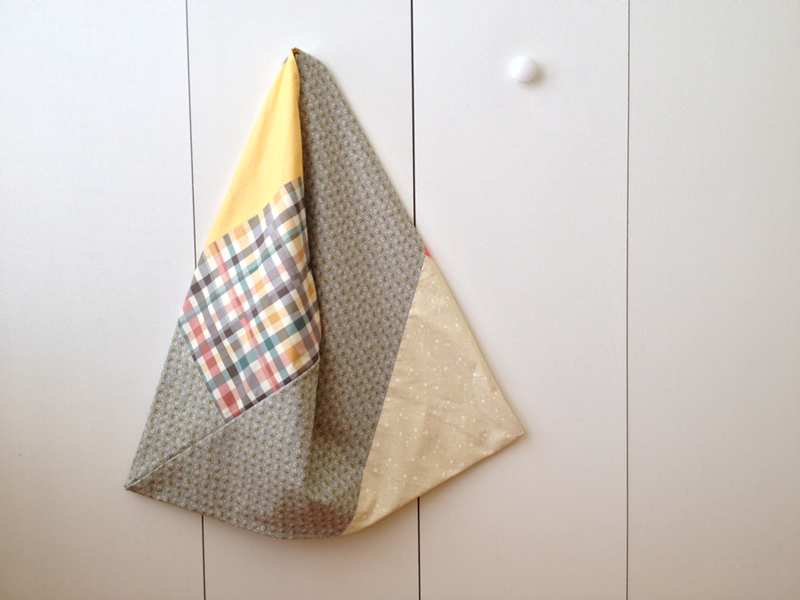 A simple project with big impact… I will certainly be making more of these in the future. Summer farmers’ markets, anyone? Yesterday, it was 75 degrees in East Tennessee. And here I thought it was December… Instead of indulging in cozy sweaters, I’ve been reduced to daydreaming of flurries and all the handmade knits I desperately want to wear. Still, in the face of unseasonal weather, I’d like to share one of my favorite knits of all time. *Drumroll* May I present, Wurm by Katharina Nopp. 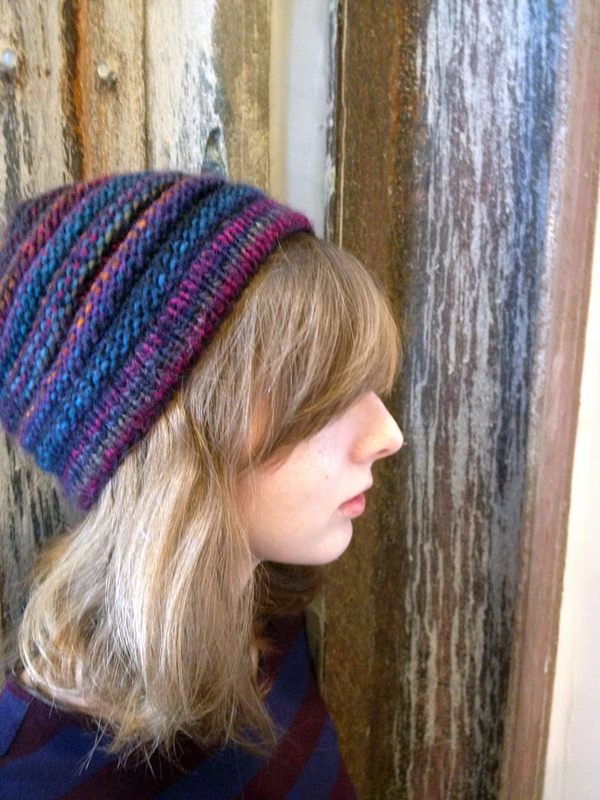 I finished my beloved wurm hat when I was still living in Chicago. 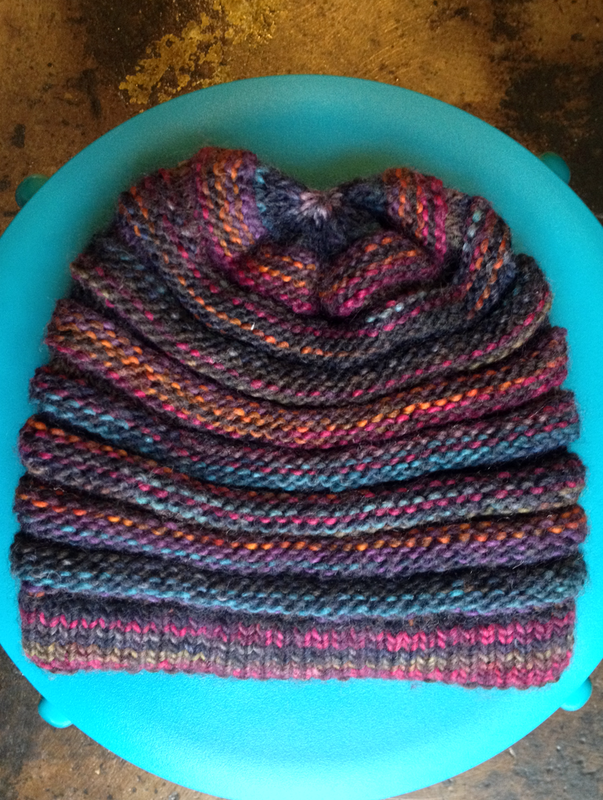 Those grad school days were long and stressful, and knitting this quirky hat was a fun way to unwind. 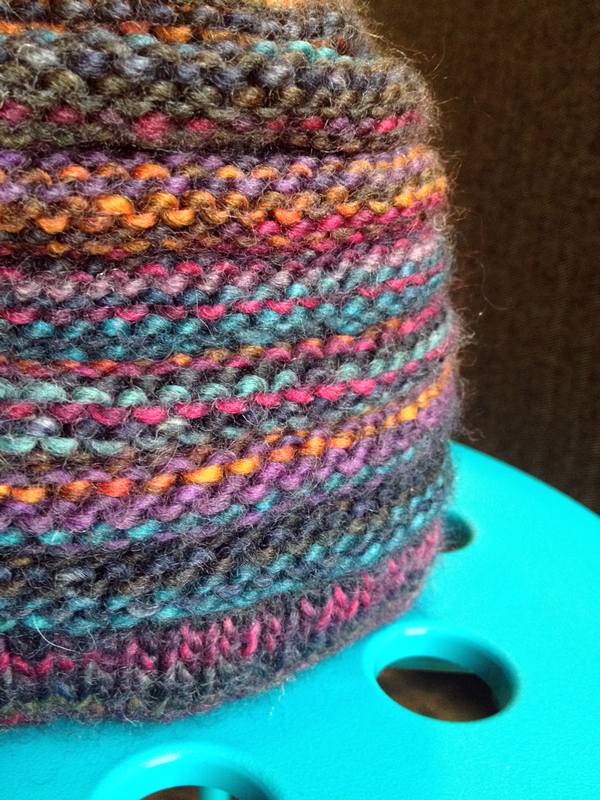 In the future, I’d love to experiment with color to play up the shape of the pattern. We’ve had lots of adventures together, most notably Snowpocalyse 2011. You might know this epic blizzard by another name, such as Snowmaggedon, Snowzilla, or, my personal favorite, snOMG. 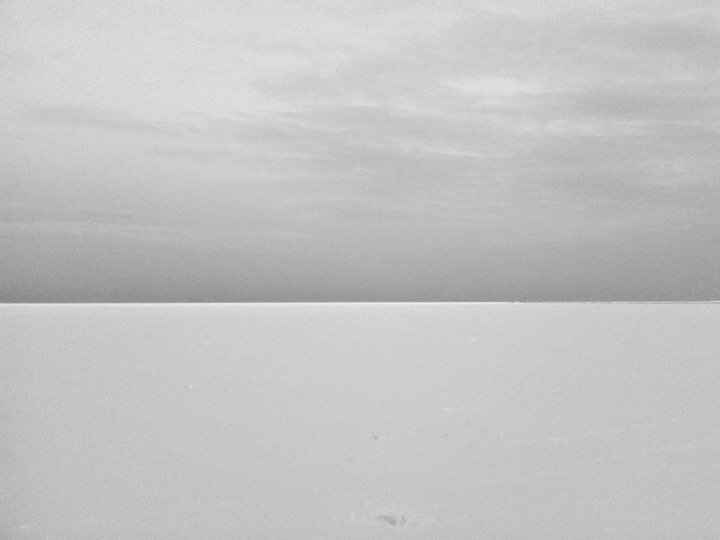 I think you get the point – there was a lot of snow. 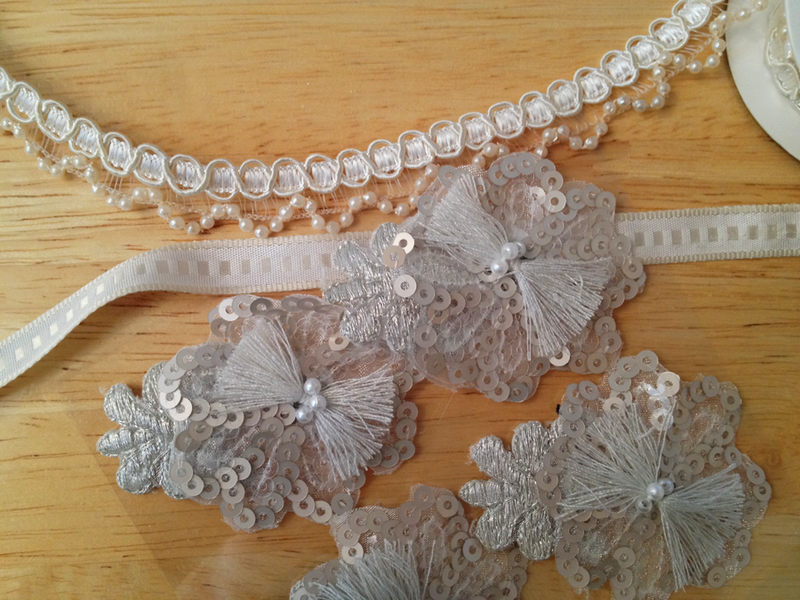 When my friend Danielle asked me to help her decorate plain sandals for her destination wedding next month, I was honored and totally ready for the challenge. 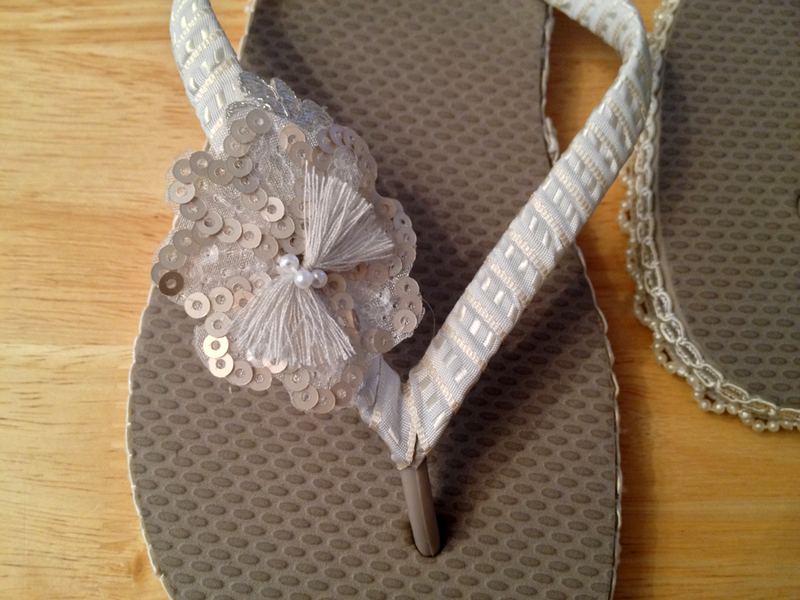 The task at hand was to transform classic Old Navy flip-flops into a comfy, but bridal-worthy reception shoe. Her dress is totally perfect for a December beach wedding, and she needed something that complimented her frothy layers and delicate embroidery. So, after some lunch and a trip to AC Moore, we armed ourselves with a glue gun and jumped right in. She’s thrilled with the results, and so I couldn’t be happier. Danielle reasoned that white or off white shoes could look dingy by the end of the night, so she opted for a soft brown that has a slight mauve hue. I’m so glad that she dared to be different since the color acts like a background for the pretty ribbons that we added. I doubt that we could have had as much impact with a more traditional bridal shoe color. 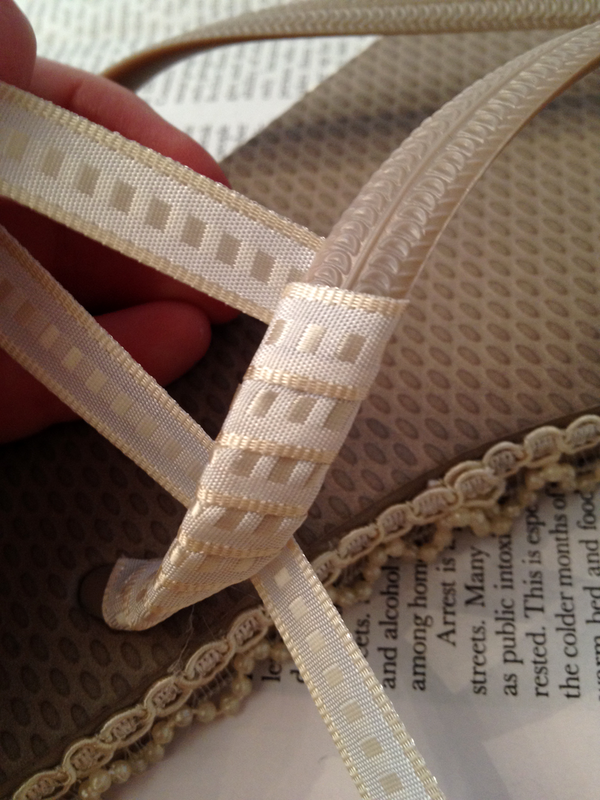 For those interested… we started by hot gluing the beaded trim on the bottom of the shoe. We began on the inside edge and kept gluing all the way around. 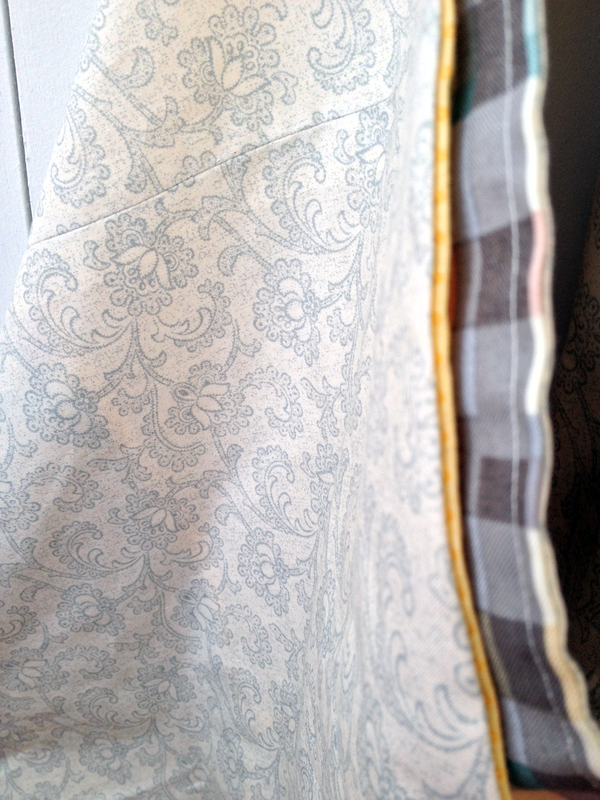 The trim lined up nicely both times and only overlapped by 1/4 of an inch. Once both shoes were dry, we tacked the cream and champagne ribbon with hot glue to the inside of the flip-flop strap and began wrapping. When finished, we secured the other side with more glue and let it sit. Then, we tried out different places for the embellished flowers – which, by the way, are actually scrapbook stickers. 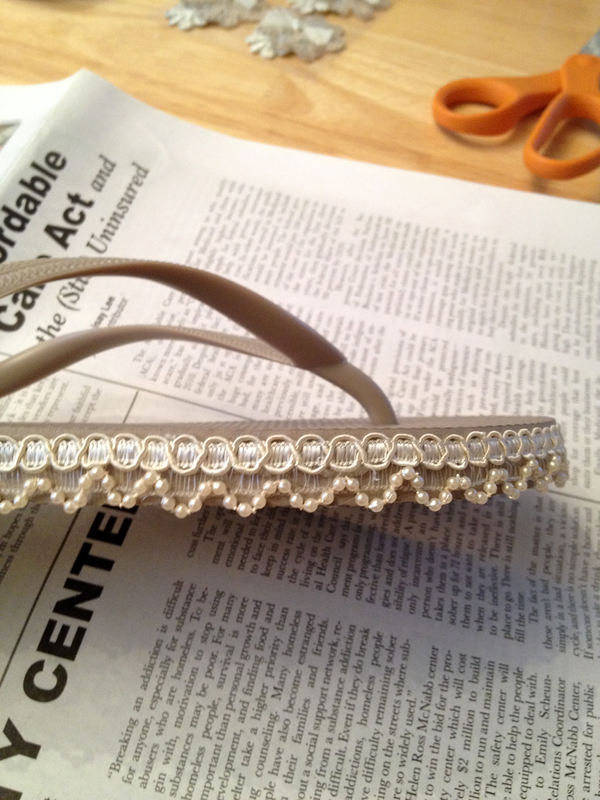 When Danielle was satisfied, we hot glued (notice a trend here?) 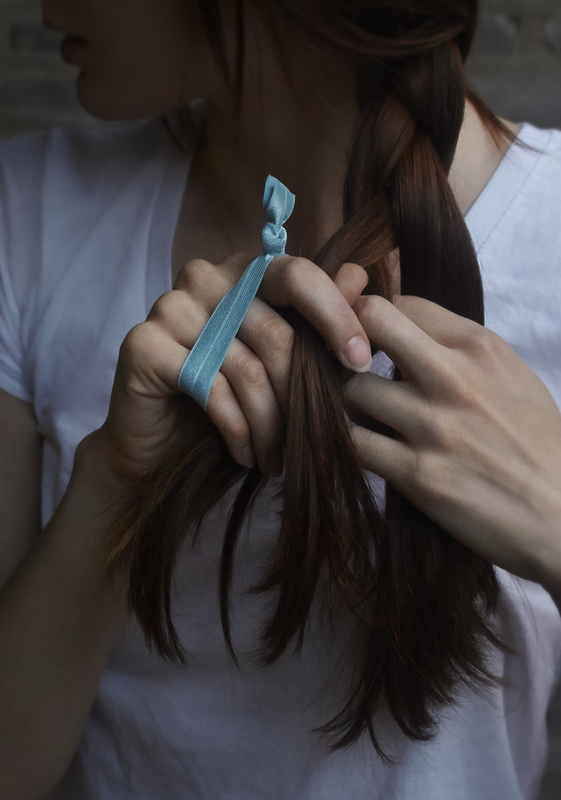 the flower directly onto the ribbon. I fully understand wedding DIY, but sometimes going cheap can venture into tackyland. 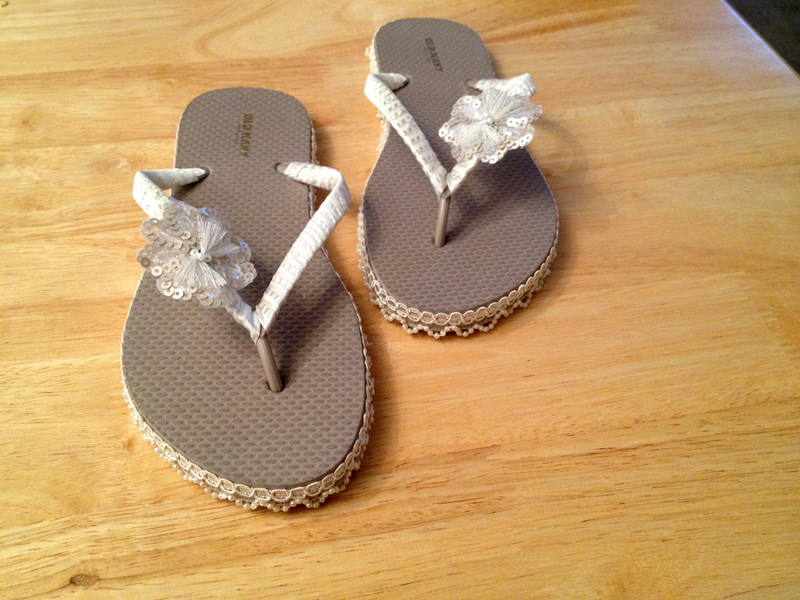 I might be bragging, but you’d never guess that these chic flip-flops cost a whopping $8 including supplies. But this is more than a DIY victory. Danielle is going to be down-right stunning on her special day, and I am happy that I got to contribute.